My name is Adepegba Oluwademilade. I am 10 years old and from Ogun State. I am a young and passionate instrumentalist. My journey into it all started from the cradle. My parents told me that the sound of music was enough to pacify me and stop my cries as a baby. Such musical instruments as guitar, keyboard, drums and flute, among others, became my solace and favourite toys. 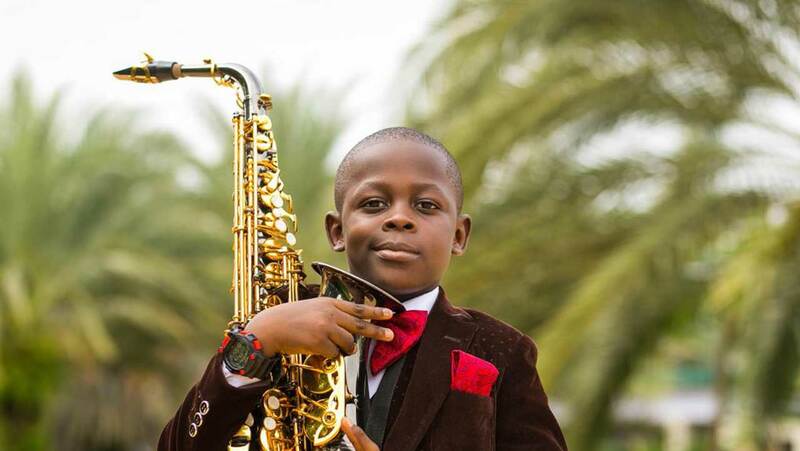 Hypersensitive to sounds and instruments, my ears and heart began gravitating towards music, its formation and expression, especially with my exceptionally dexterous fingers that first started running the scales of the keyboard before running that of Saxophone. As a little boy, nothing fascinated me as music, the reason my mother would never leave home for choir rehearsal without taking me along. And to everyone’s amazement, I paid absolute attention with all my heart only to get back home singing the entire songs in my childish manner. By the time I was four years old, I had become a master at playing the recorder. The amazing interest I had in music and growing keenness for it prompted my parents to get me a keyboard, and a tutor at age six. Within a few weeks, I was consumed with the mastery of playing the keyboard, sight-reading and had developed an extraordinary sense of tonation. I started to live music. I would play in the morning before going to school, after school, and would often wake up in the middle of the night to rehearse musical inspirations. I could play all the cartoon soundtracks I have watched with no mistake. So, I pleaded with my parents to get me a Saxophone, which I got as a birthday gift. To everyone’s astonishment, I began playing it with a proficient dexterity. The biggest initial hurdle was striking the balance between my love for playing the saxophone and my schoolwork. But I was able to overcome it because my parent had to draw a line. A timetable was drawn and there are days I don’t play the saxophone at all. There are days I play it. It soon became part of me. It has all been so amazing and interesting, and in the end, I found out that music has helped me perform even better in my academics. Are there books you are reading and which you’d recommend for other entrepreneurs? I don’t really read other books apart from my schoolbooks. But I take out time to read about lives of music legends, especially saxophonists. I study how they play to improve my skills. So, I’d like to encourage those that love playing the saxophone to start studying the great ones. It will surely inspire and keep them going. Did you ever deal with contention from family and friends concerning your entrepreneurial pursuits? How did you handle it? Not at all. All I get is love and support from my family, especially my parents who even go out of their way to pay tutors and get me expensive instruments as soon as I desire such. Although some people feel I am learning too fast for my age, but as long as I have my parents’ backing, I’m good. What would you say was the single most influential factor in your business success? It is God. And my parents, who are sensitive enough to identify my passion for art, especially music at a very tender age and helped me develop it. I owe it all to God and my parents. What have you learned that you wish you knew when you first started? Nothing really, but I see every day as an opportunity to learn more and improve on my craft. And don’t forget that I’m still growing. I’m just a 10-year-old boy. What advice would you give to local and international upcoming entrepreneurs? When it comes to music, there is no shortcut. It’s rehearsals, rehearsals and more rehearsals. The more you practise, the better you become. Just follow your dreams, don’t get upset or discouraged. Also, be willing to learn at all times and nothing works like hard work. Finally, always trust God to bring out the best in you. What other things do you do apart from music? Aside playing the saxophone and keyboard, I also love watching football and wrestling. Definitely. I can be tracked on my day-to-day activities on my instagram @demiladeadepegba Facebook Demilade adepegba and YouTube Demilade Adepegba.